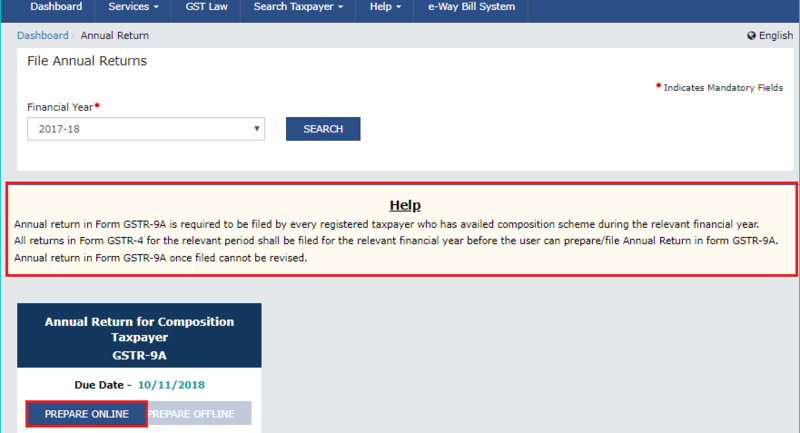 How To File GSTR-9A On The GST Portal ? All taxpayers registered under the Composition Scheme of GST are required to file their annual returns in the Form GSTR -9A. Details pertaining to outward supplies, inward supplies, taxes paid, refund claimed, demand raised or input tax credit availed are required to be provided in this annual return form. 1. Who must file GSTR-9A? 1. A taxpayer who has opted for the composition scheme at any time during the financial year. 2. A taxpayer who opted out of the scheme in the middle of the year. a. GSTR-9 for the period 1st July 2017 to 30th September 2017.
b. GSTR-9A for the period 1st October 2017 to 31st March 2018.
c. Thereafter, for each financial year, he should file GSTR-9A till he opts out of the scheme. 1. A taxpayer should have opted for composition scheme for at least a single day in a financial year. 2. A taxpayer should have filed all GSTR-4’s for the financial year, before filing GSTR-9A. 3. A taxpayer should preview Form GSTR-9A before filing because it cannot be revised after filing. Login to GST Portal and go to the ‘Services’ Tab, click on ‘Returns’ and then click ‘Annual Return’. Select the ‘Financial Year’ on the ‘File Annual Returns’ page. An important message will pop up detailing the steps to be performed for the Online/Offline filing of GSTR-9A. Click ‘Prepare Online’. Note: At present, the offline tool for filing GSTR-9A is not made available. It has to be filed online. Answer the question as to whether you want to file a Nil return for the financial year. Select ‘Yes’ only if ALL of the criteria mentioned below are satisfied. 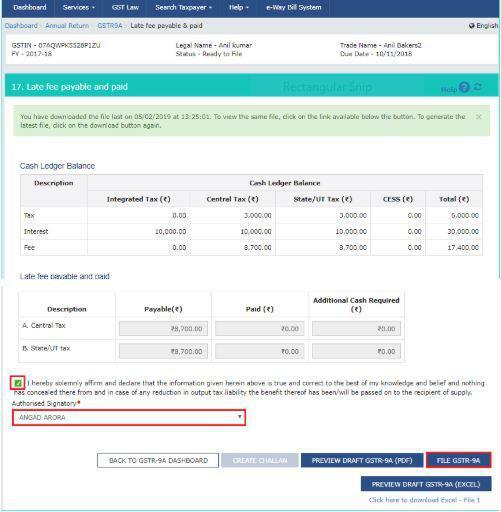 If yes, provide the turnover details of the previous financial year, click on “compute liabilities” to compute late fees, if any, and proceed to file. 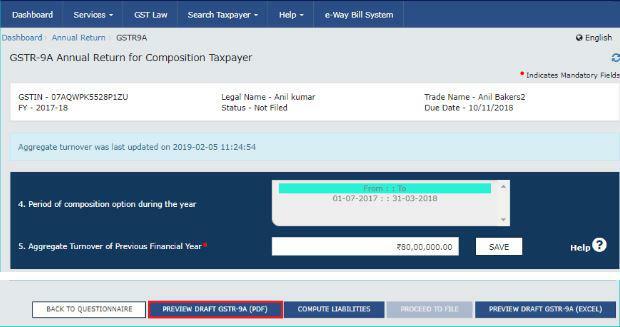 If no, then the ‘GSTR-9A Annual Return for Composition Taxpayers’ page will be displayed reflecting various tiles for which details need to be filed. Firstly, select the period for opting composition scheme and fill the aggregate turnover for the same. Then, download system computed summary of GSTR-9A and GSTR-4 summary by clicking on the respective tabs. This will help in providing details in actual tables. 1. Click on the ‘Details of Outward supplies made during the financial year’ tile. Details will be auto-populated from Filed GSTR-4 return. 2. Enter the turnover details. If the details are more/less than 20% of the auto-populated details then the cells will be highlighted. A confirmation message will pop up asking if you want to proceed despite deviation. 3. Click ‘yes’ to accept the details. 4. A confirmation will pop up displaying ‘save request is accepted successfully’. 5. Go back to the ‘GSTR-9A dashboard’. The outward supply tile will reflect the total turnover & tax details. 1. Click ‘Preview GSTR-9A (PDF)’ on the GSTR-9A dashboard. 2. A draft will be downloaded and the same can be edited if required. 1. Click ‘Preview GSTR-9A (Excel)’ on the GSTR-9A dashboard. 2. A draft will be downloaded and a link will be displayed. 3. Click on the link to download a ‘zip file and the excel file of summary GSTR-9A can be extracted from it. 4. The taxpayer can edit the excel file if required. Note: The Preview Summary should be reviewed in detail before computing liabilities. Once the return is filed, the same cannot be revised. On clicking ‘Compute Liabilities’, the GST portal will process all the details provided in various tables. It also calculates late fees if there is a delay in filing return. After some time, a confirmation message will be displayed saying ‘ready to file as on date’. The taxpayer can make the payment from the funds available in the electronic cash ledger. In case, the funds are less in the cash ledger, the additional payment can be made via Netbanking, over the counter or NEFT/RTGS by creating an additional payment challan. A taxpayer should again preview the draft GSTR-9A in PDF/Excel format by following the same steps as mentioned in Step 4. Note: Reviewing the file again is a must because now it will reflect the details of late fees paid and payable. 1. Select the declaration check box and then select the ‘Authorised Signatory’. 3. Submit Application page will be displayed with two options for filing. 4. File with DSC: Taxpayer has to browse and select the certificate. Sign and submit. 5. File with EVC: An OTP will be sent to the registered email ID and mobile number. Validate the OTP. Upon successful validation, the status of the return changes to ‘Filed’. A taxpayer can make any additional payment through Form DRC if any. The link will be displayed on the successful filing of the return.